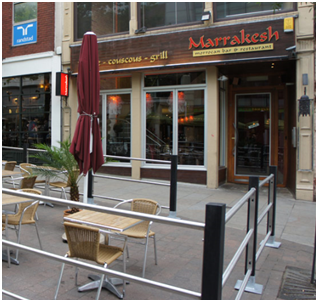 Marrakesh is located amongst a number of other restaurants on Chapel Bar in Nottingham where it competes for business with Las Iguanas, Sinatra et al. Serving North African cuisine the interior matches the theme in furnishings along with incense, shisha and on some evenings even a belly dancer. Lighting was somewhat on the low side so not my best photography ever here. Prices are reasonable with starters at £4 and mains £10-13 with a number of good set menus and options. At lunch they offer 3 dishes for as little as £6.99. The wine list is short but has an interesting range of options, we drank a Lebanese offering which complimented the food well. 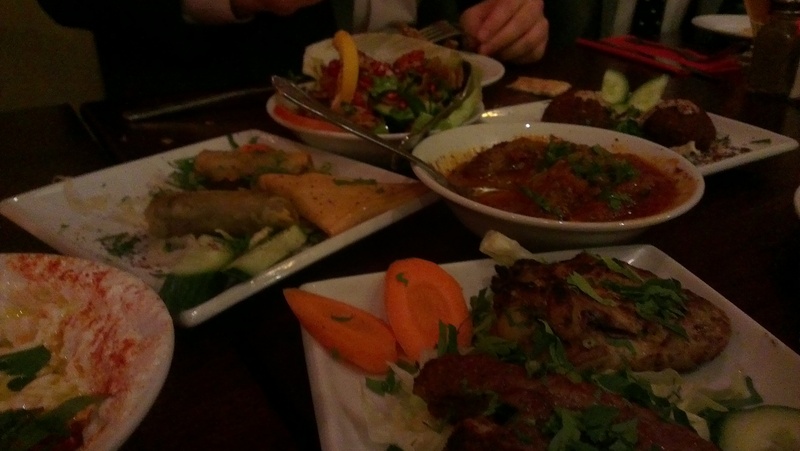 We started by sharing a set mezze menu allowing us to sample a good range of food. Vine leaves and Baba Gannough were traditional and pleasant but the hot dishes were where the kitchen came into its own. Samboussek’s particularly stood out; both lamb and feta versions having bags of flavour between perfectly cooked pastry – I would go back for these alone. Everything was well seasoned and a liberal use of herbs, parsley and coriander, throughout. Despite the abundant ‘starter’ we thought it remiss not to venture into a number of the main courses too. I ate a Mergaze tagine, spicy sausages in a rich tomato sauce which I enjoyed although spice was more subtle than I might have liked. I chose couscous over rice as a tagine accompaniment but it failed to stimulate, as is often the case with the little grain. 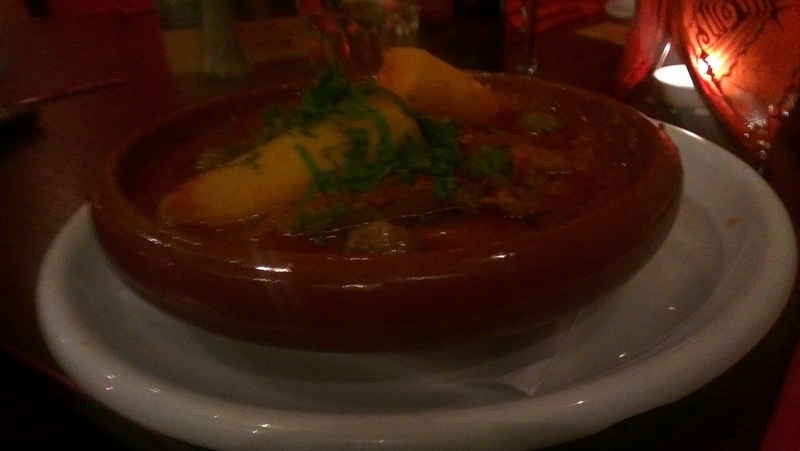 Another tagine, of the lamb variety, was well received by a friend hers with preserved lemons and more earthy flavour. Lamb Kofta, densely meaty and cooked well on skewers was good but lacking a lubricant of some description to bring things together. Dessert was a little mixture of pastries – Baklava. Konafa and Basbousa which were sweet and nutty as expected. I was impressed with Marrakesh, service was good throughout and arrival of dishes well paced. The value is reasonable too and I would chose returning here over a lot of the chain options and standard fare in the vicinity of Chapel Bar.